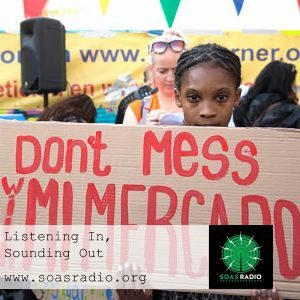 Welcome to a new episode of “Listening in, Sounding out”, an open show which aims to share the narratives which we learn by listening in on people’s musicking and spaces’ sounding. This episode tells a story of El Pueblito Paisa, or also Latin Village, which is located next to the Seven Sisters tube station in North London. The market is home to a predominantly Columbian community and has one of the highest concentrations of Latin American businesses in London. Since 2004, the community has been battling to resist a regeneration scheme which is being imposed on the market by the Haringey Council and Grainger development company. These development plans will require the demolition of the market to make way for 196 non-affordable residential units and 40,000 sq. ft of retail space. On the show we will be speaking to Stefanie Alvarez, a Latina from London who grew up in the market. Her mother, Victoria Alvarez, is a Colombian trader at El Pueblito Paisa and has launched a crowdfunding campaign through which she is trying to cover costs for the legal fees needed to challenge discrimination and harassment which Latino traders are facing from the council appointed market facilitator. These acts of harassment are attempts to disintegrate the market’s community from within and make way for Grainger’s development scheme. If you can’t get the chance to visit the market, this is an opportunity to take an auditory walk through it and hear from one of its most active community members. We hope you enjoy the show while we sound out! In this first episode, we speak to Reylon Yount, an MA student of “Music in Development”. Reylon plays the... Read more..